Scoliosis is a curvature of the spine. It may or may not be noticeable at birth and may worsen during the adolescent growth spurt. It may present as a raised shoulder, an uneven breast line, uneven hips, walking difficulty, or obvious differences in arm lengths. 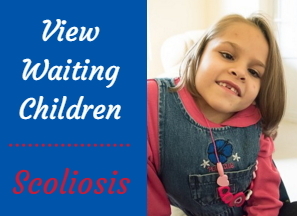 There are many families that have adopted a child with Scoliosis, club foot, or other orthopedic differences. Please use our website to read family adoption stories, view children waiting to be adopted, and learn more about this and other medical conditions experienced by children living in institutions and orphanages. Surprisingly, Scoliosis in mild forms usually does not cause pain, and the individual may not be aware of the problem. Early treatment can correct the curvature. Treatment involves physical therapy exercises to strengthen the muscles, shoe lifts to even out the pressure on the spine, bracing, and in severe cases, surgery. Although scoliosis is sometimes present with other birth defects such as spina bifida, it can occur singularly. This condition does not affect the growth or intellect of the child, but it is advisable to seek treatment to correct the curvature before permanent damage occurs.